Folding security gates are used by manufacturing and warehouse facilities, retail and distribution centers, education and health care institutions and in homes and office buildings. Steel Gauge Folding Security Gates help control and regulate security, ventilation, and visibility for warehouse dock doors, receiving doors, lift-up doors, office buildings hallways, and entranceways. 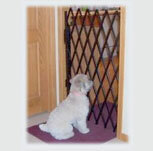 Portable, Aisle and Pet gates are a perfect temporary, mobile security gate for many applications. All of our gates are USA Made by Security Gate Company. We manufacture the "classic" design of the folding steel gate that we have been making for over 40 years. The mission of our business is to make a quality product at a competitive price that meets or exceeds our customers' requirements. Our folding gates are made here in DeKalb, IL near Chicago and we deliver nationwide across the USA. We only provide the best quality folding security gates that are durable, sturdy and corrosion resistant. We make these folding security gates in many sizes that will fit any gate need you may have. Standard sizes include gate sizes from 4-1/2' wide by 5-1/2' high single folding gates to 16' wide by 8-1/2' high double folding gates. We also make custom sized single and double folding security gates up to 10' high. Click here to see all of our security folding gate products and sizes. Call for quotes on custom sizes at 1-866-754-4030. Our steel gauge folding security gates are also easy to set up and install. Click here to see our installation guide. 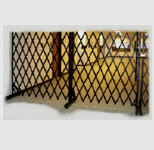 All folding security gates include a locking bar. Gates are able to ship via UPS Ground. Multiple units may need to ship via an LTL common carrier due to weight constraints.